The Falcon Battalion (NCWC Bravo Company) will be recognized and known for a standard of academic and leadership excellence that prepares our graduates to be commissioned and succeed as the future officer leadership of the United States Army. To recruit, retain, develop and commission the future officer leaders of the United States Army and motivate young people to be better citizens through support of local JROTC programs. The objective of the Army Reserve Officers’ Training Corps (ROTC) is to train, motivate and prepare selected students with potential to serve as Commissioned Officers in the Regular Army, Army Reserve or the Army National Guard. The program is designed to provide an understanding of the fundamental concepts and principles of military art and science and to develop leadership and managerial potential in the student. A strong sense of personal integrity, honor and individual responsibility, and an appreciation of the requirements for national security are instilled in all students. 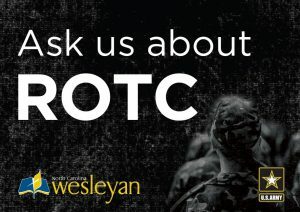 Enrollment in the Army ROTC Military Science courses is open to all students attending NCWC. The Army ROTC program offers elective courses for undergraduate and graduate students leading to a commission in the United States Army. Students may compete for four-year, three-year and two-year scholarships. For more information, contact the Director of Military Studies, James Mercer, LTC USA (Ret), in the Hartness Student Center at 252.958.5340 or 252.955.7004. Start Strong in Life – Enroll in Army Reserve Officers’ Training Corps (ROTC), the college elective for undergraduate and graduate students that provides leadership training for success in any career field. If you have a passion for it, you can find a place to fit in the Army as an officer and get the training you need to turn that passion into a career. Available at over 1,100 colleges and universities nationwide, ROTC offers merit-based scholarships that can pay up to the full cost of tuition and open educational opportunities. Whether you’re in high school, college or already in the Army, you can become an officer in today’s Army through joining ROTC. All scholarship recipients receive $1,200 annually for books and a $420 monthly stipend (dependent on year student is in the ROTC program). Q: If I join Army ROTC, does that mean I am joining the military? A: No. ROTC is a training program for military officers, but the students in the program have not yet joined the military. 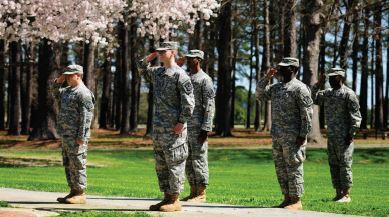 Students who complete the ROTC program will join the military after graduating from college, at which time they will be commissioned as second lieutenants in the Army, National Guard or Army Reserve. Q: What is my obligation? A: Most ROTC graduates have a four-year commitment. Q: How much time do students have to spend with ROTC each week? A: Approximately six hours per week for freshmen and sophomores, eight hours per week for juniors and seniors. What are the benefits of being in Army ROTC? 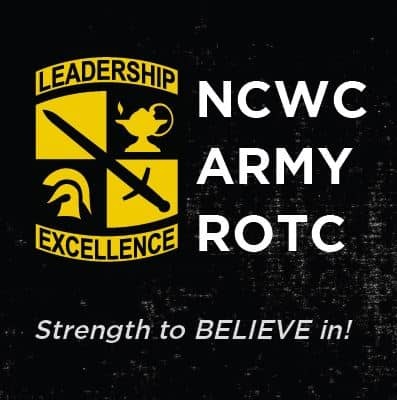 Students and Parents: For questions regarding general information, how to join Army ROTC or scholarships contact James Mercer, LTC USA (Ret) at jmercer@ncwc.edu or 252.985.5340/252.955.7004. JROTC Cadets: Start by contacting your Cadet Chain of Command, Senior Army Instructor or Military Science Instructor.